The Quilter's Trunk is a proud retailer of BERNINA sewing, quilting and embroidery machines. Make Tax Time a little less painful! This month, get 20% off the MSRP of your NEW BERNINA! Now that’s Happy! 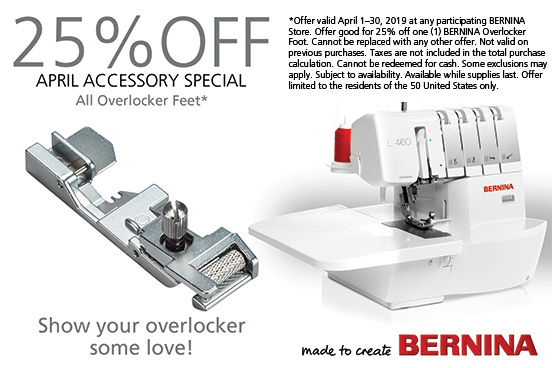 In April, all overlocker feet are 25% off! Looking for a machine for a new sewist or a travel machine? Look no further than the newly redesigned bernette lineup! The bernette machines have great features and a great price tag! Test drive a bernette in store, or shop online. TQT is pleased to offer Sewing & More financing from Synchrony as well as BERNINA Credit. Options include 0% interest with equal monthly payments (Equal Pay) or 0% interest if paid in full within promotional period (Deferred Interest). Subject to credit approval, minimum monthly payments required.